This is just a little mini entry in the blog - nothing too special, but something that may crop up again from time to time. 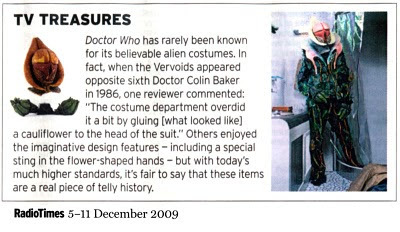 The Radio Times, the BBC’s tv listings magazine in the UK, runs occasional little articles under the titles ON THIS DAY and TV’S TREASURES (sometimes LOST Treasures). 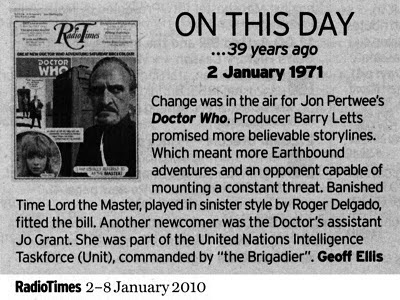 One This Day is a daily feature showing a back issue of the Radio Times from years gone by and highlights a programme that was screened on today’s date, that also took the cover for that week. On the 2nd of January 2010, the cover was for a Doctor Who episode from 1971, marking the first appearance of The Master (see below). Then, this week, under TV Treasures, there was a piece about a dalek dating from 1979 which had been sold in auction twice in the last four years (see below). This isn’t the first time the Radio Times has highlighted Who-related items sold at auction. 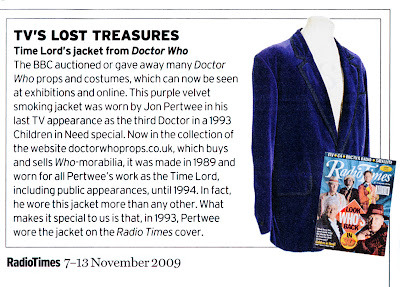 In November last year a similar piece was run about Jon Pertwee’s smoking jacket (see below) which had been sold at the Bonham’s Auction on 16th June 2009. I showed that article previously under Costume Changes - Appendix. 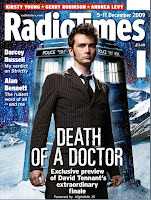 A further piece appeared in a December issue, which also had David Tennant on the cover in anticiaption of the up-coming Christmas episodes (see right). The piece highlighted the head and gloves of a Veroid, which had also been sold at the same Bonham’s Auction as the smoking jacket (see below). There is due to be another auction at Bonham’s in February, so no doubt there will be other similar articles appearing in future. I’ll keep an eye open for them and post them in the blog relating to the appropriate Doctor’s era.